Transfer photos saved in the internal memory of the camera to your computer. Mac: Use the "Photos" app or Image Capture. Photos from the camera can be deleted from the computer. Photos cannot be transferred to the camera from a computer. Image slant is not corrected for images imported from the camera. Image slant is automatically corrected when displayed using the computer application. 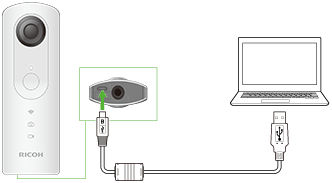 Do not turn off the power or remove the USB cable while importing photos.